Humankind’s ventures away from Earth originally resided for millions of years in the imaginations of vast numbers of known and unknown thinkers. Then, after World War II, the reality of the Cold War between the forces of democracy and tyranny emerged. The Apollo Program to put an American on the Moon grew out of the global challenge to Western democracies from the then Soviet Union. Soviet success in placing an artificial satellite, Sputnik I, in earth-orbit on October 4, 1957, not only punctuated that challenge but had the unintended consequence of awakening a sleeping tide of patriotism, imagination and courage within young Americans. At the same time, Sputnik I energized a bipartisan political consensus that America should respond beyond just matching that accomplishment. This consensus was led by President Dwight D. Eisenhower and included, most notably, Senator Lyndon B. Johnson, Democrat of Texas, and Representative John McCormack, Republican of Massachusetts. Eisenhower and the bipartisan Congress concluded that the Nation’s response should be civilian rather than military in nature and thus created National Aeronautics and Space Administration (NASA) in 1958, largely through the combination of the National Advisory Committee on Aeronautics (NACA), the Jet Propulsion Laboratory (JPL), the Army Ballistic Missile Agency (ABMA), and the Air Force’s development of the F-1 rocket engine. A critical next step was Eisenhower’s January 1960 directive to NASA Administrator T. Keith Glennan to accelerate the development of the “super booster,” that later morphed into Apollo’s Saturn V moon rocket. As a new President, John F. Kennedy, came to realize the full scope of the Soviet Union’s technical and psychological challenge, he put the Apollo Program on the fast track as a national strategic priority. On July 20, 1969, Neil Armstrong became the first man to step on the Moon, meeting Kennedy’s commitment to do so by the end of the decade of the 1960s. That event’s psychological impact on Soviet leadership probably contributed greatly to the fall of the Soviet Union when challenged by the Strategic Defense Initiative proposed by President Ronald Reagan. The Apollo Program also initiated a revolution in the scientific examination of the Solar System. First of all, it gave us a first order understanding of the sequence of events and the processes by which the Moon evolved since its formation about 4.57 billion years ago. This sequence gave us our first factual insights into the early history of the Earth and the violent impact environment in which life began. Apollo also showed us that the Moon has the resources necessary to settle there and to reach beyond that small planet to Mars and even farther into the Solar System. Those resources include a light isotope of helium that potentially can provide clean fusion power on Earth as well as fusion-propelled interplanetary rockets. Our distant ancestors could access geological information about the Moon as they planned monthly hunting and gathering around ancient African lakes. Looking closely at a full Moon, unchanging month after month, they would have seen irregular light regions interrupted in some places by dark circular areas of both sharp and irregular definition. If these ancestors had good eyes and squinted, they also would have seen several very bright spots across the face of the Moon. In the mid-16th Century, the observations and logic of Nicolaus Copernicus, following in the footsteps of Nicole Oresme, Nicolaus Cusanus, and probably other, now unknown observers, demonstrated that the Moon orbited the Earth while both orbited the Sun. William Gilbert later assisted the Copernican revolution of thought with his conclusion that the Earth rotated once every 24 hours based on observations of terrestrial magnetism. Then, near the beginning of the 17th Century, Galileo Galilei invented the telescope. Through this remarkable example of human ingenuity, Galileo soon discovered that highly cratered “terra” dominated the light regions, or highlands; that many fewer craters existed within the dark circular areas, or lowlands, at first mistaken as seas, or “maria”; and that vast systems of bright rays radiated from single craters within the bright spots noted by earlier observers. Wintertime view from the south of Galileo’s Villa, “Il Gioiello”, in Arcetri, Italy. His office/study/library is behind the ground-floor window bathed in sunlight at left behind the terra cotta vase. Galileo’s observations of the Moon were made from the open balcony at right behind the tall Cypress tree. One of his final discoveries from this platform was the libration of the Moon made by measuring the positions of large craters and the circular maria as a function of time (Photo by Giovanni Cera, 2012). Through the efforts of Johannes Kepler, Isaac Newton, Gottfried Leibniz and others, also in the 17th Century, astronomers gained theoretical and mathematical means of calculating the Moon’s shape (roughly a sphere), size (radius about 1738 km), mean-density (about 3.34 g/cm2), and moment of inertia (about 0.400 for the principal moment). 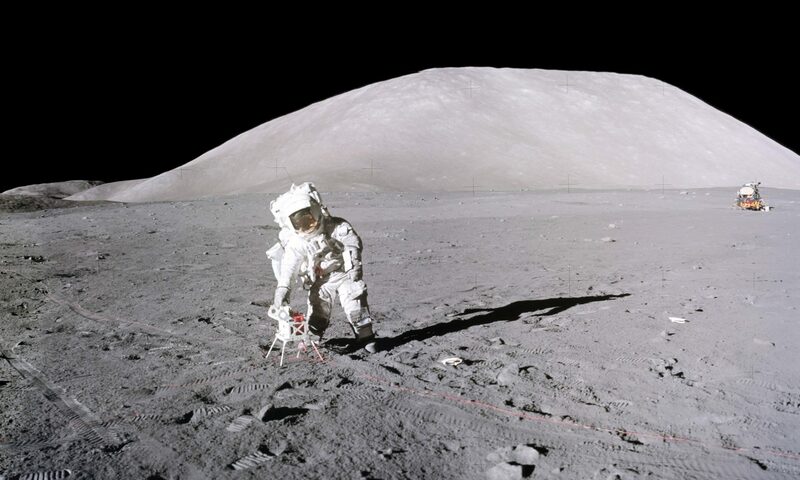 These data placed constraints for later investigators on the Moon’s composition, that is, it probably would resemble the overall chemistry of stony meteorites rather than iron meteorites, having significantly less iron than the Earth and the Sun. Within the estimated moment of inertia, the distribution of mass was limited to that essentially of a uniform solid sphere. Finally, observations, including solar eclipses, would have shown that no clouds or atmosphere encircled the Moon so that its surface has no protection from the ravages of space debris and solar radiation. Interestingly, Kepler, in 1610, also may have been the first to speculate about human visits to the Moon, followed by John Wilkins in 1638. Grove K. Gilbert’s late 19th Century studies of the Moon marked the beginning of the modern era of lunar studies. Scientific interest in the Moon increased slowly but steadily. Ralph B. Baldwin and Eugene M. Shoemaker provided best summaries of the understanding of the nature of the Moon prior to the dawn of lunar exploration through robotic spacecraft. In the following chapters, I detail my personal experiences and perspectives as the Lunar Module Pilot and scientist on the Apollo 17 mission to the valley of Taurus-Littrow, the sixth and most recent human visit to the Moon. Although many events and the help of many persons led to this opportunity, and my personal preparation as an astronaut more than met any requirements for flight, my actual presence on the crew of Apollo 17 came through the intervention of George M. Low, then Deputy Administrator of NASA. I will be forever in the debt of this good friend and a giant among the many remarkable managers that brought together the talent, imagination, courage, motivation and stamina of 450,000 others who made Apollo happen.